If you already have an existing Private Draft League that has completed your draft (you can still use the upcoming new live draft room next year) you are in for some very exciting news. These new Commissioner tools allow your league to enjoy the first and only real time multi-player draft leagues for Baseball simulation leagues. What is the benefit of real time web based multi-player leagues as opposed to the old stand alone PC leagues? In short, a Commissioner’s dream unless you like the drudgery of importing and exporting league files only to get stats, standings and leaders from last week or even last month. That is way outdated in today’s connected online world. 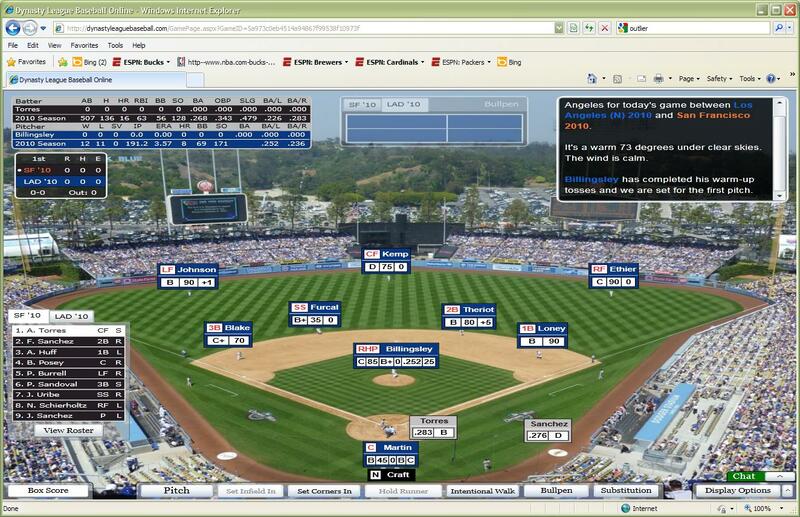 DYNASTY League Baseball Online allows your league to have your stats, standings, leaders and box scores updated in real time. You can even watch other league games box scores and game summaries update in real time which is a great feature for late season pennant races when you want to know the “out of town” scores in real time. The new Private Draft league creation tool lets you create a private league by entering the league name, number of teams and team names in the league. Once you enter the number of teams you will see options for the number of divisions and playoff format. You will also select the number of series your league will play each week and the scheduled league play times. Keep in mind that the scheduler allows you to submit changes in game time for any of your scheduled series during the season and you also can have the new Computer Manager profile manage for you if you can’t play that week. Once your Private Draft league is created there is a page that allows the Commissioner to edit the settings of the league. The Commissioner is then be able to go to a page to invite friends into the Private Draft league. You can also use the current “Invite a Friend” button on the left hand column of the home page to invite people you know to DYNASTY League Baseball Online using their email address. Once new people you invited have an account you can then add them as your friend. League members can choose and edit their team settings. Once a league member is invited to a private draft league he can then select his team settings. After you have created your Private Draft league, then the league Commissioner can use the new roster tool to place the players on each team. 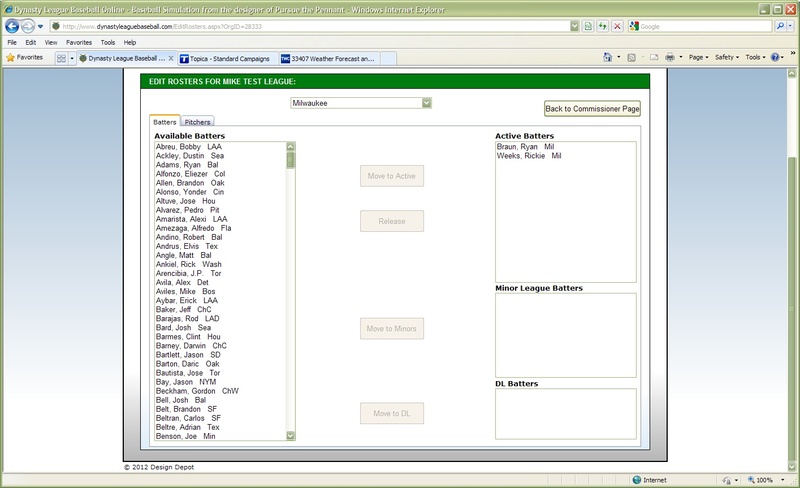 The roster tool interface allows you to promote and demote players to and from the major and minor league rosters. The screen shot shows Ryan Braun, Rickie Weeks, Cory Hart, Prince Fielder, Francisco Rodriguez, Yovanni Gallardo, Zack Greinke, Shawn Marcum, Randy Wolf and John Axford added to the roster. The new scheduler tool allows you to use the default 12 and 24 team schedules or you can manually create your own schedule. You can then use the scheduler Commissioner Tool to enter each series and build the schedule. The new Private Draft League tools are easy to use and will allow you to start playing your DYNASTY League Baseball Online private draft league.